I would do anything for this woman. 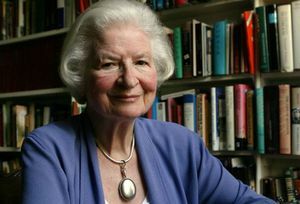 This is P. D. James, one of the finest mystery writers, no, one of the finest writers alive. She just turned 91 and is still writing. (She didn’t publish her first novel until she was 42.) She is my hero. Even better than her life story is her writing. I read her novels over and over again, enjoying her mastery of craft as well as her world-class storytelling gifts. She is particularly good at setting. Interestingly enough, that’s usually where her novels start. “My own detective novels, with rare exceptions, have been inspired by the place rather than by a method of murder or a character,” she writes in her non-fiction gem, Talking About Detective Fiction. Ready… Reserve one of P.D. James books at your library or buy one at an independent bookstore. One of her novels will teach more about writing than a million blog posts. Today’s prompt: It’s rare to think about setting first. Too often, we go for what is safe and predictable. If we have a teen protagonist, then we set the story in a high school. If it’s a middle grade novel, there might be scenes at the mall, the skatepark, and a babysitter’s house. The goal is to stretch. Put your character on the moon if you want. Just describe it well. If the description does not come easy, think in terms of small detail. We’ll talk about this more tomorrow! Thanks for another great post. This one made me think about where my main character can squirm. PD James is one of my favorites–half the photos of me with my newborn (almost 22 years ago now) include a shot of one of her paperbacks. I also find I remember her settings better than I remember who committed the crime. Thanks for the inspiration today. I was just finally getting ready to write, and your post appeared! I’ve been following along in the challenge and have written an assortment of things – just trying to discover my inner writer. It was fun thinking of my character in unexpected places. I could see starting a story using some of these ideas. Many of mine seemed to have a little bit of action to them as well – hiding, clinging to a dime, stuck, etc. Love this post. Which are your favorite P.D. James books? What is a good one to start with? I may have to abscond with this quote and post it on my blog. And then get seriously tenacious. Next PostNext WFMAD Day 16 – Early bird catches worm, etc.